Establishing if life ever existed on Mars is one of the outstanding scientific questions of our time. To address this important goal, ESA has established the ExoMars programme to investigate the martian environment and to demonstrate new technologies paving the way for a future Mars sample return mission in the 2020s. There are two missions in the ExoMars programme: one comprises the Trace Gas Orbiter (TGO) plus an Entry, Descent and Landing Demonstrator Module (EDM), dubbed Schiaparelli, launched in 2016, and the other, comprising a rover, with a launch date of 2018. Both missions are in cooperation with Roscosmos. The 2016 ExoMars/TGO carries scientific instruments to detect and study atmospheric trace gases, such as methane. EDM contains sensors to evaluate the lander’s performance as it descends, and additional sensors to study the environment at the landing site. In addition to its prime science mission, the orbiter also carries a sophisticated radio relay capability provided by NASA. The Electra Proximity Payload (Electra) is a telecommunications package that acts as a communications relay and navigation aid. Serve as a data relay platform to support communications for the ExoMars 2018 rover and the surface science platform, as well as partner agency rovers. 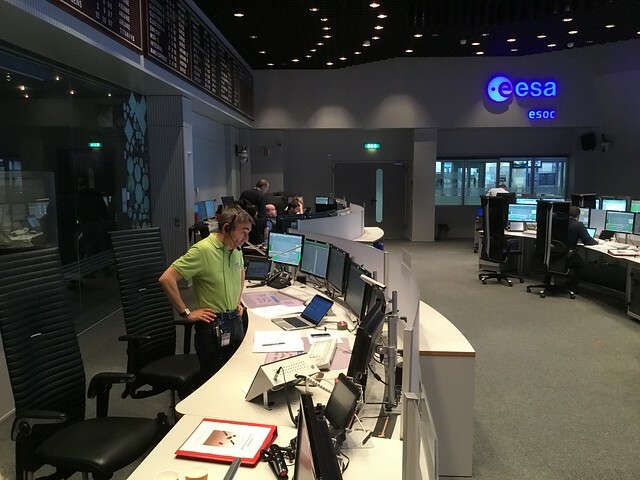 The Flight Control Team (FCT) operates TGO from a Dedicated Control Room (collocated with the DCR for Mars Express and Rosetta) at ESOC, Darmstadt, Germany. Spacecraft Operations Manager (SOM) Peter Schmitz oversees a team of 14, including spacecraft operations engineers, mission planners, analysts and spacecraft controllers. Additional experts from across the ESOC centre are supporting the mission with specialised knowledge in several areas, including flight dynamics, software support and ground stations. This support is increased during prelaunch training and simulations, the crucial launch and early orbit phase, during certain periods of the cruise to Mars and the deep-space manoeuvre and during the orbit arrival manoeuvres. Every moment of this complex and challenging process will be overseen by the ExoMars mission controllers at ESOC, with crucial support by ESA’s science operations team at ESAC, ESA’s establishment near Madrid, Spain, and by industrial experts at Thales Alenia Space (Italy & France), among others. At ESOC, the ExoMars Flight Control Team are supported by experts from flight dynamics, ground stations and software systems to conduct TGO mission control. Once Schiaparelli separates and later lands, its mission will be automated, based on settings developed by ESA’s industrial partners. 14 March 2016: The two-week launch window opens. Lift off from Baikonur is set for 09:31:42 GMT (10:31:42 CET) on a powerful Russian Proton-M launcher, equipped with a Breeze-M upper stage. The separation of TGO and Schiaparelli from Breeze is expected at 20:13 GMT (21:13 CET), and the pair will then be en route to Mars on the initial interplanetary transfer orbit. For the ExoMars Mission Control Team at ESOC, Darmstadt, a critical moment on launch day will be receipt of the first signals from TGO, expected at around 21:28 GMT (22:28 CET), via the Malindi ground tracking station in Africa. This will enable ESOC to establish full command and control of the craft, and begin a series of critical health and function checks. Until 24 April: En route to Mars, the spacecraft is now in the commissioning phase and mission control teams at ESOC, instrument teams and science operations teams at ESAC check out, verify and test all systems and instruments. Schiaparelli will similarly be checked out by industrial teams from Thales Alenia Space. 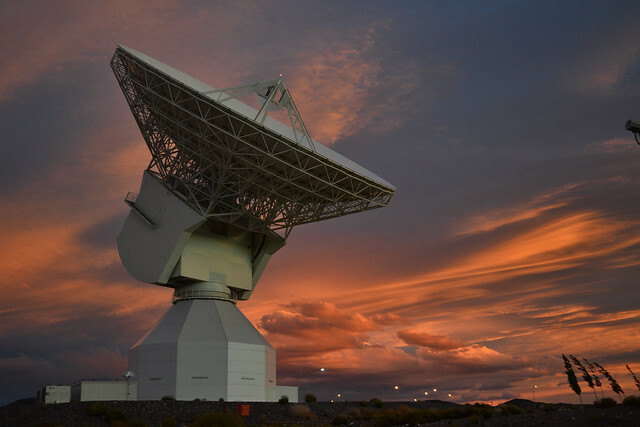 Daily communication passes are provided by ESA’s New Norcia deep-space station during daylight hours in Darmstadt, with additional support from ESA’s Malargüe station as required. May 2016: ExoMars enters the cruise phase as it continues enroute to Mars; onboard activities are relatively quiet and ground station passes are scheduled only three times weekly. Mission control teams continue verifying and confirming the health and functionality of TGO and Schiaparelli in the harsh environment of interplanetary space. Teams at ESOC will conduct a series of ultra-precise navigation measurements known as ‘delta-DOR’, for Delta-differential One-Way Ranging. This advanced technique uses signals received from quasars deep in our Milky Way galaxy to correct the radio signals received from ExoMars, resulting in an extremely precise position determination. Results will be used to calculate the upcoming midcourse correction manoeuvre (also called the deep-space manoeuvre). A second Delta-DOR campaign in September–October will generate results that will help to determine the Mars orbit injection for TGO and the final Schiaparelli descent trajectory. 28 July (forecast): TGO carries out one of the most critical activities during the voyage to Mars: a very large engine burn in deep space that changes its direction and speed by some 326 m/s. This midcourse trajectory correction will line the spacecraft up to intersect the Red Planet on 19 October. In August–October, the work of the mission control teams will become steadily more intense, and ESA's ground stations are now providing daily telecommanding passes. In the final 10 days before arrival, New Norcia and Malargüe ground stations will provide 24 hr/day radio contact as engineers at ESOC carefully monitor the spacecraft and plan its complex orbit-entry activities. The final commands for the Schiaparelli EDM will be prepared and uploaded, and all systems on both TGO and Schiaparelli will be thoroughly checked out in the run up to arrival. 16 October 2016: TGO will eject Schiaparelli at 14:42 GMT (16:42 CEST, forecast), dispatching it on a three-day descent to the surface. ESA will enlist the support of NASA’s giant 70 m-diameter Deep Space Network (DSN) ground stations at Canberra, Australia, and Madrid, Spain, to listen for the spacecraft’s signals as the module separates. Schiaparelli will be dispatched on a direct intercept course toward Mars, on track to enter the atmosphere and conduct a challenging descent and landing on 19 October, lowering itself to the surface for a soft landing under parachutes. 17 October 2016: About 12 hours after Schiaparelli has separated, TGO will conduct an ‘orbit raising manoeuvre’ – a modest but crucial engine burn that must provide a change in direction, raising its trajectory to several hundred kilometres above the planet (otherwise, like Schiaparelli, TGO, too, would intersect the surface on 19 October). This manoeuvre will line the craft up for a second critical burn on 19 October, which will slow it sufficiently to be captured by Mars’ gravity. During the critical arrival activities, several of NASA’s 34 m-diameter deep-space stations will provide a ‘hot back-up’ to ESA’s stations, ensuring that there is no loss of communication at a time when any delay in commanding could have serious effect on orbit entry or landing. 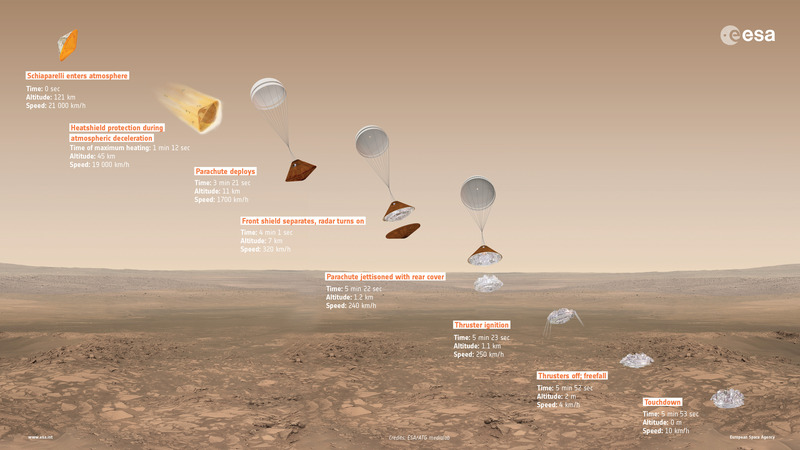 Three days after separation, TGO and Schiaparelli each undergo the most critical portions of their journey to Mars. Continuing on its post-separation ballistic orbit, the 600 kg Schiaparelli wakes up 75 minutes prior to entering the atmosphere, expected at 14:42 GMT, at an altitude of 122.5 km and a speed of about 21 000 km/h. An aerodynamic heatshield protects Schiaparelli from the severe heat flux and deceleration; at an altitude of about 11 km, the 12 m-diameter parachute is deployed. Descending under its parachute, Schiaparelli releases its front heatshield at an altitude of about 7 km and turns on its Doppler radar altimeter, which can measure the distance to the ground and its velocity relative to the surface. This information is used to activate and command the propulsion system once the rear heatshield and parachute are jettisoned 1.3 km above the surface. Between 1300 m and 2 m altitude, the propulsion system slow it from 270 km/h to 7 km/h. At that height, the thrusters are switched off and Schiaparelli freefalls to the ground, where the final impact, at just under 11 km/h, is cushioned by a crushable structure on the base. Schiaparelli will target a landing site on the plain known as Meridiani Planum. This area interests scientists because it contains an ancient layer of haematite, an iron oxide that, on Earth, almost always forms in an environment containing liquid water. During Schiaparelli’s critical descent on 19 October, ESA’s Mars Express probe, which has been orbiting the Red Planet since 2003, will monitor and record signals from the module. Schiaparelli’s descent is also expected to be recorded on Earth by scientists using the Giant Metrewave Radio Telescope (GMRT), located near Pune, India, and operated by the National Centre for Radio Astrophysics, part of the Tata Institute of Fundamental Research. GMRT comprises an array of 30 radio telescopes, each with a dish diameter of 45 m, and it is one of the world’s largest interferometric arrays. This activity promises to provide an extremely important confirmation of the module’s descent and landing, and signifies a major area of international cooperation between ESA, NASA and India for the Schiaparelli mission. On the same day, 19 October, TGO will carry out two critical activities, almost at the same time. First, it will use its radio system to record signals from Schiaparelli during descent, similar to Mars Express. This information will be stored onboard and later transmitted to Earth, where it will be processed at ESOC to extract telemetry and other information to enable a detailed reconstruction of the descent profile. Second, it will conduct a critical engine burn, using its 424 N main engine for the Mars Orbit Insertion (MOI) manoeuvre. This will slow TGO by 1550 m/s, sufficient to be captured into an initial Mars orbit (double what was needed for Mars Express capture in 2003), and will last about 134 minutes, beginning at 13:09 GMT. This critical manoeuvre will be tracked by ESA and by NASA 70 m ground stations, which will provide periodic updates to mission controllers at ESOC. Successful completion of the burn, expected at 15:23 GMT, will mark the second time Europe has placed a spacecraft into orbit around the Red Planet. The initial highly eccentric orbit is dubbed the ‘4 Sol’ orbit, as it will take TGO four Mars days to complete one revolution, with its altitude above Mars varying between 298 km and 95 856 km. Capture by Mars means that TGO can begin a lengthy series of orbital adjustments. Between January and November 2017, TGO will employ sophisticated aerobraking techniques – the first time ESA will do so to attain a science orbit around another body in our Solar System – to steadily lower itself to a circular, 400 km orbit. With aerobraking, the TGO solar wings will experience tiny amounts of drag from the wisps of atmosphere at very high altitudes, which will slow the craft and lower its orbit. While aerobraking takes time, it uses very little fuel and will itself provide scientific insight into the dynamics of Mars’ atmosphere. The TGO science and radio relay missions will begin in December 2017. TGO features a sophisticated radio relay capability provided by NASA. The Electra system is a telecommunications package that acts as a communications relay and navigation aid. It comprises twin ultra-high frequency (UHF) radios and will provide communication links between Earth and craft on Mars, rovers or landers. TGO will provide daily data relay services to NASA’s Curiosity and MER-B (Opportunity) rovers currently on the surface, as well as to the InSight lander and ESA’s ExoMars 2018 rover. It will also support Russia’s 2018 lander and future NASA rovers. ESA is now establishing a new European Relay Coordination Office (ERCO) at ESOC to manage scheduling, planning and day-to-day control of the service, which will also employ ESA, NASA and Russian ground stations for download, receipt and distribution of the scientific data. ERCO will make use of sophisticated new techniques to conduct relay coordination on a semi-automated basis, making it the central European hub for relay of precious scientific data between landers and orbiters at Mars. Flying NASA’s Electra payload with its advanced data relay capabilities on ESA’s TGO marks a significant deepening of cross-agency cooperation and mutual support at Mars. Primary communication services for ExoMars will be provided by ESA’s tracking station network – Estrack – a global system of ground stations providing links between satellites in orbit and mission control at ESOC, Darmstadt, Germany. The core Estrack network comprises nine stations in seven countries. On launch day, contact between mission controllers and ExoMars/TGO is maintained via the Italian space agency’s 2 m dish antenna at Malindi, Kenya, and by ESA’s 15 m stations at Maspalomas, Spain, and Kourou, French Guiana. Subsequently, as the craft embarks on its journey to Mars, tracking and telecommanding duties are handed over to ESA’s ‘Big Iron’ – the 35 m-diameter deep-space tracking stations at Malargüe, Argentina, and New Norcia, Australia. These two stations can provide 24 hr/day communication coverage, so long as the spacecraft is visible from the southern hemisphere. During critical phases, NASA’s Deep Space Network stations will provide crucial tracking and telecommanding support. The diagram above depicts the ExoMars ground segment architecture. It indicates the large international cooperation and shows the complexity to operate this interplanetary science and data relay mission. The TGO spacecraft, designed by ESA, builds on the heritage accumulated from earlier ExoMars mission scenarios. NOMAD combines three spectrometers, two infrared and one ultraviolet, to perform high-sensitivity orbital identification of atmospheric components, including methane and many other species. This suite of three infrared instruments will help scientists investigate the chemistry and structure of the martian atmosphere. A high-resolution camera (5 m/pixel) capable of obtaining colour and stereo images over a wide swathe. This neutron detector will map hydrogen on the surface down to a metre, revealing deposits of water-ice near the surface.